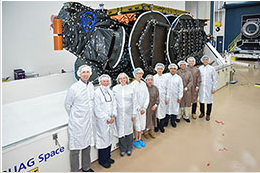 AsiaSat and SSL teams with the AsiaSat 9 payload before shipment. From Russia's Proton Breeze M rocket to the upcoming launch of AsiaSat's most powerful satellite, AsiaSat 9, all are getting ready for this week's launch. 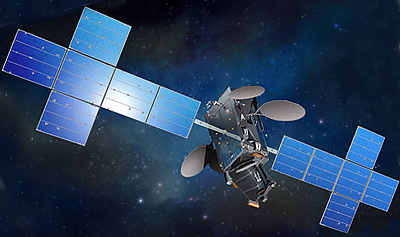 AsiaSat 9, described as the most powerful satellite from Asia Satellite Telecommunications Co. Ltd. (AsiaSat), Asia’s leading satellite operator is set for launch at 00:52:16 Baikonur time on September 29 (02:52:16 Hong Kong Time September 29; 18:52:16 GMT September 28) by an ILS Proton Breeze M rocket from the Baikonur Cosmodrome, Kazakhstan. This next generation satellite, based on the SSL 1300 platform, telis designed to replace AsiaSat 4 and to provide multiple C-, Ku- and Ka-Band payloads for direct-to-home (DTH) television broadcast, video distribution, VSAT broadband networks and mobility services at 122 degrees East longitude. With innovative and cutting-edge features such as Asia’s highest powered 110 watts C-band TWTA, special filter design, star tracker and hall effect thrusters, AsiaSat 9 is able to deliver enhanced performance, higher efficiency and operational stability. AsiaSat 9 will also offer brand new coverage for high growth markets in Asia, including the world’s first dedicated Ku-band Myanmar beam, high-power Ku-band beams for Indonesia and Mongolia, in addition to two enhanced Ku-band beams serving Australasia and East Asia, and a wide C-band footprint that offers significantly improved power over Asia, Australasia and the Pacific region. The mission is performed by the Proton Breeze M rocket from launch pad 39 at the Baikonur Cosmodrome in Kazakhstan. The first three stages of the Proton will use a standard ascent profile to place the orbital unit (Breeze M upper stage and the AsiaSat 9 satellite) into a sub-orbital trajectory. From this point in the mission, the Breeze M will perform planned mission maneuvers to advance the orbital unit first to a nearly circular parking orbit, then to an intermediate orbit, followed by a transfer orbit, and finally to a geosynchronous transfer orbit. Separation of the AsiaSat 9 satellite is scheduled to occur approximately 9 hours, 13 minutes after lift-off. Live broadcast will begin approximately 30 minutes before lift-off.